So I thought it was about time I had a new blog header, I’d had my previous one a while and this year is all about change for me. I wanted something original so I went in search of a illustrator. I found one in the shape of Emily from Fleurelle Illustrations. I had an idea in mind already and she brought it to life perfectly. I’m probably most distinguishable because of my glasses and you don’t really see many bloggers in glasses. Or I haven’t come across many! 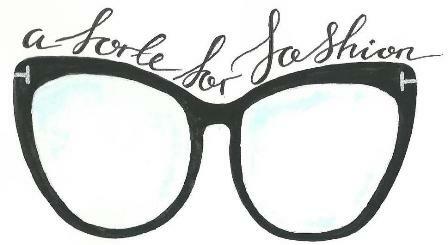 So I went to Emily with my idea of actually picking out my glasses as a feature for my blog logo and that’s how it came to be. I have to commend Emily for her service through out, she sent me a sketch to check I was happy with the initial design. She not only delivered the image digitally but she popped the original sketch and a CD with the image on in the post for me too. This sketch will be sitting pride of place above my desk when I have it all set up. What do you think to my new logo? "Event: La Redoute AW15 Press Day"